We have completely redesigned and renovated the design of our box. The box follows the look of the catalogue and website and brings the recognition to our end product; at the same time it brings more recognition of the brand name Sorex on all the markets where we are present. We believe that with new and innovative design of the box our customers will be even more satisfied and our brand name Sorex even more recognized in Europe and wider. 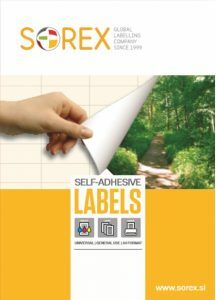 Sorex labels Ltd. © 2017 All Rights Reserved. Website design SOLITUS plus s.p.